Update 2010/07/10: There have been some concerns expressed over recent seismic activity at Volcano Katla. There is nothing being reported from the Icelandic Met Office that indicates a concern. Active volcanos tend to have regular periods of seismicity. These recent events are of low magnitude and are not believed to be indicative of imminent eruption of Katla. The earthquake charts on the Met site are updated constantly (near real-time according to the Met Office) and the colours do not indicate severity, only time elapsed since last occurred. Earthquakes greater than magnitude 3 are indicated by a star icon. Update 2010/04/24: Note: This will be EWR’s last report on the current event sequence at Eyjafjallajökull unless there is a substantial change in events. I invite you to explore the links included throughout this post to develop an understanding of the Eyjafjallajökull event. The Active Monitoring sidebar will continue to list the quicklinks for NORDVULK and the webcams. This post will be added to the general Active Monitoring list for quick access as the EWR blog moves forward. The bulk of the information presented has been drawn from situation reports of the Nordic Volcanological Center, Institute of Earth Sciences, University of Iceland. Certain links contained below represent specific research efforts of indviduals and are attributed where appropriate. As has been noted in this latest sitrep, the eruption has not ceased and there remains concern about future activity. While Katla is not considered at immediate risk of eruption, the association with Eyjafjallajökull means it will continue to be monitored. Conditions at eruption site: North crater still active. Mild explosive activity with spatter thrown to 100 m height above crater. Shockwaves occur every few seconds. North of crater a roughly 300 m long and wide depression has been melted out in the last three days. Steam plumes rise from the depression, especially at the margins. This is explained by lava flowing northwards from the crater with the steam rising where lava meets ice. Seismic tremor: Magnitude similar to what it has been over the last few days. Overall assessment: Magma flow rate has remained at similar level over the last few days. Plume activity is gradually declining. Flow of lava is considered to have began around noon on Wednesday 21 April. Timing is based on: a) onset of semi-continuous discharge of meltwater from Gígjökull, b) Observations of steam rising at northern margin of ice cauldon at 1300 on 21 April, and c) a change occurs in fluctuations in tremor amplitude at this time. No signs of melting or meltwater discharge towards south. No signs of termination of eruption. Screencap 2010/04/17 8:45 EDT Eyjafjallajökull from Valahnúk, Iceland. Mila webcam. Impact on European Air Travel 2010/04/17 13:25 UTC. Normally the airspace over the United Kingdom, Scandanavia and northern Europe is full of planes. Ash cloud over Europe April 16, 2010, NASA Earth Observatory photo. Media: Britain closes airspace as volcanic ash spreads. The Boston Globe has some good shots in their Big Picture series and here too. Compiled by Freysteinn SigmundssonInformation sources: Nordic Volcanological Center, Institute of Earth Sciences; Icelandic Meteorological Office (seismic and hydrological observations) and many others. 20 March, late evening: An eruption begins on Fimmvörðuháls located between the Eyjafjallajökull and Mýrdalsjökull ice caps. The eruption was initially detected visually; a red cloud above eruptive site was seen around 23 GMT. The onset of the eruption was gentle, following a period of weeks and months prior to the eruption of high seismic activity and high crustal deformation rates in the Eyjafjallajökull volcanic system. Seismic tremor begins around 22:30 and rises gently. Seismicity was not enhanced significantly immediately prior to the eruption compared to the weeks prior to the eruption. However, the depth of earthquakes decreases and earthquake propagate from magma upwelling area under Eyjafjallajökull towards the eruptive site. 21 March: Observations from air in early morning reveal a short (<500 m) NE-SW oriented effusive eruptive fissure with fire fountaining and Hawaiian eruptive style. Fire fountains occur from 10-12 vents, with lava jets reaching up to about 100 m hight. The eruption appeared stable from 4-7 AM when viewed from air. The eruption tremor rose gently until reaching a maximum around 7-8 AM. No further lengthening of the fissure was detected. Lava is limited to immediate surroundings of the eruptive craters (less than few hundred meters). Minor amount of ash falls within few km to the west of the eruption site, carried by easterly winds. No ice melting is occurring as the eruptive fissure is just outside the ice covers of Eyjafjallajökull and Mýrdalsjökull. 22 March: Initial observations from ground. Activity had focused on a series of closely spaced vents. Prevailing easterly winds lead to maximum scoria accumulation on a linear rim west of the NE-SW oriented fissure. Lava flows (Aa type) towards the Hrunagil canyon with initial view on a spectacular „lava fall“ as molten lava flows off steep cliffs into the canyon. 23 – 31 March: Steady eruptive activity in initial craters with gradual focusing towards fewer vents. Lava flows towards north into two canyons, Hrunagil and Hvannárgil, with intermittent spectacular „lava falls“ as molten lava flows off steep cliffs into both canyons. Extensive steam plume generation when magma melts snow in front of advancing lava, mostly in the canyons. Two or three plumes observed (one at the eruptive craters, others more pronounced in front of the advancing lava). Meltwater released in batches into rivers in the canyons. Relatively steady eruption tremor recorded by seismometers. Evening of March 31: Opening of a new short fissure immediately north of the previous one probably relating to changes at shallow depth in the feeder channel (few hundred meters?). No change in eruption tremor. 31 March – April 6: Activity continues in both the old and new eruptive craters, in a similar manner as before, with lava mostly flowing towards the NE, and pronounced „lava falls“ in Hvannárgil. Last active phase of the of the lava fall into Hrunagil on 31 March. April 5: Eruption tremor (1-2 Hz frequency band at nearest seismic station Godabunga) begins to decline in a gradual manner. April 7: Activity has stopped in the original craters of the eruption, and is limited to craters on the new fissure formed on 31 March. Lava flows cover an estimated area of 1.3 square kilometers, with estimated average thickness of 10-20 m. Maximum elevation of scoria craters formed in the eruption is 82 m.
April 9: After little change in deformation rates during the eruption, timeseries at continuous GPS-stations north of the volcano show sudden change, partly jumping back to pre-eruptive levels. Signals may relate to decreasing pressure in the magma conduit feeding the eruption. April 11: Eruption tremor approaches pre-eruptive levels, but visual observation reveal eruptive activity in late afternoon. April 13: Extensive seismic swarm begins around 23:00 under the central part of Eyjafjallajokull. April 14: Onset of seismic tremor shortly after midnight of increasing amplitude, in association with an eruption from a new vent under the central ice-capped crater of Eyjafjallajokull. 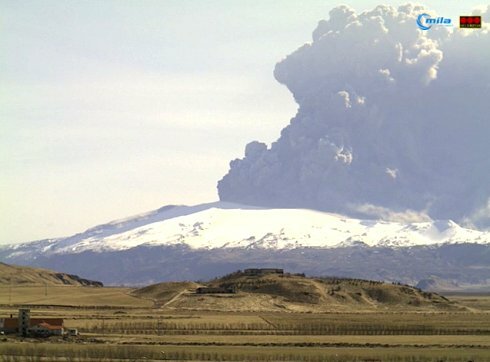 The eruption is visually confirmed in early morning – eruption plume rises above Eyjafjallajokull. Meltwater forms a jokulhlaup. Saturday night, Mar 21, 2010, at about 11:30, residents of Fljotshlid, Iceland, noticed an orange flare from the vicinity of the Eyjafjallajökull glacier. A kilometer long fissure has opened in a passage in Fimmvörduhals, between glaciers Eyjafjallajökull and Mýrdalsjökuland and volcanic magma was erupting up through the fissure. Scientists say the eruption seems to be small and since it is not under a glacier, the danger is less than it might have been. An Icelandic Coast Guard aircraft flew over the eruption early this morning. For three hours the plane circled the area and Karl Sigurbjörnsson of RÚV filmed this dramatic video of the eruption (do watch the video – the images are quite spectacular). The immediate area was evacuated and has been closed to travel. This is a popular tourist area of Iceland, and there is a well-known hiking trail in the vicinity of the eruption. Residents have been allowed to return, but the area remains closed to tourists. 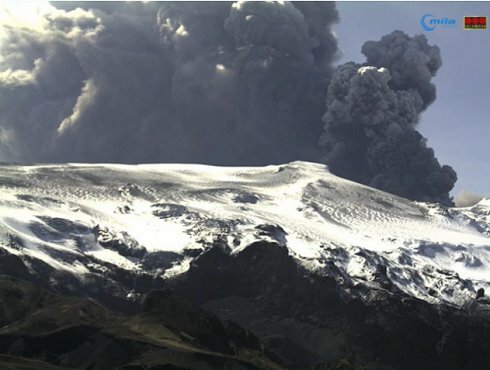 There are concerns that the eruption could spread to beneath the glacier, and there also a watch on Katla (see also Katla Volcano at the Institute of earth Sciences ), a nearby large, presently dormant, volcano. Katla has erupted before, and eruptions under glaciers are especially serious due to rapid melting of large volumes of ice, creating near instant high volume floods. The Iceland Review Online is running constant updates as more information comes available.